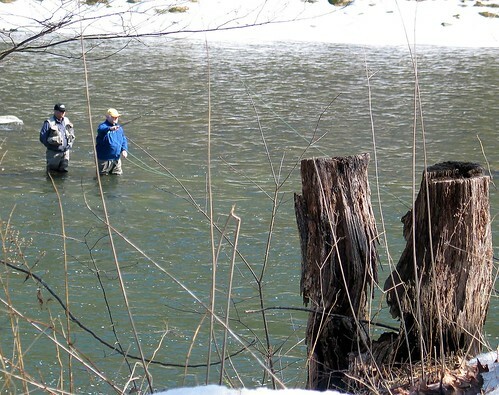 It seems a little cold yet for fly fishing - even with waders their legs must be freezing. (The river still has lots of ice on it as you'll see tomorrow.) And even if they manage to stay in the water long enough to catch anythign they still have to contend with this. March 30 is the one-year birthday of Sharon Daily Photo. Come celebrate with me! I've just read the warning, that's scary stuff. I don't think I'd eat any fish from there. My husband was an avid flyfisherman and I can recall scenes like this on opening day!